Tags: Antique Map, Borneo, Java, Sumatra. Antique Map of Sumatra, Borneo and Java by De Bry titled ‘Nova tabula Infularum Iava, Sumatra, Borneonis et aliarum Mallaccam usqua, delineate in insula Iava, ubi ad vivum designantur vada et Brevia Scopulique interjacentes defcripta a C.M.A.L’. A very rare and much sought-after late 16th century map of Sumatra, Borneo, Java and the southern part of the Malay peninsula engraved and published by the German engraver and bookseller Theodore de Bry in the German edition of Part II of De Bry’s Petits Voyages published in Frankfurt in 1598. 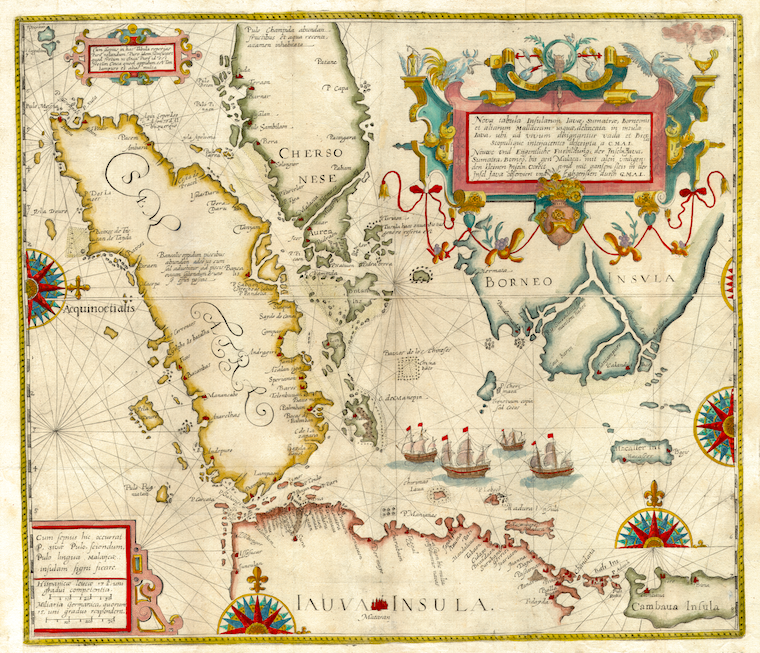 The map is base on the work of Linschoten and derived from an identical map, but with the addition of six vignettes, compiled by Willem Lodewijcksz, a member of Cornelius de Houtman’s pioneering voyage to the East Indies in 1595-97. The initials C.M.A.L./G.M.A.L. in the cartouche refer to Lodewijcksz. The map shows the dangerous southern route to the Spice Islands via the Java Sea, which was threatened by Muslim States hostile to the Portuguese. The four ships in De Houtman’s fleet are shown in the map sailing north of Java to the west and possibly representing the fleet returning to the Sunda Strait after circumnavigating Java island. The last decade of the 16th century heralded the emergence of the Dutch as the colonial power that was to supersede Portugal as the premier trading nation in Asia and establish a tyrannical hold on the East Indian Islands and the trade therefrom for the next 350 years. Dutch navigators, already familiar with the waters of the North Sea and the Baltic, probed vainly for a northern route to the Far East that would circumvent the Spanish and Portuguese fleets patrolling their trade routes, but the passage could not be found. In desperation, the Dutch decided to fight their way to the Spice Islands and Southeast Asia by way of the coast of Africa and the Cape of Good Hope. This period of Dutch dominance, begun with the exploratory voyages of Cornelius de Houtman to Bantam, a northwestern port in Java. In 1592 Cornelis de Houtman was sent by Amsterdam merchants to Lisbon for four years to discover as much information on the Spice Islands as he could. When he returned to the Netherlands he brought with him precious information about the seas and lands of the East, and details about the strengths and weaknesses of the Portuguese. De Houtman determined that Bantam (Banten) provided the best opportunity to buy spices. In 1594 the Dutch company ‘compagnie van Verre’ (meaning: the long-distance company) was founded, and on April 2, 1595 four ships with on board 249 man left Amsterdam in search for the Spice Islands. The voyage was beset with trouble from the start, and scurvy broke out after only a few weeks, due to insufficient provisions. At Madagascar where they stopped briefly, seventy people had to be buried. On June 27, 1596 the ships finally arrived at Banten, Java. The information stolen from the Portuguese learned them to not pass through the Malacca Strait, which was controlled by the Portuguese, but through Sunda Strait between Java and Sumatra. At Java De Houtman was introduced to the Sultan of Banten, who promptly entered into an optimistic treaty with the Dutch, writing “We are well content to have a permanent league of alliance and friendship with His Highness the Prince Maurice of Nassau, of the Netherlands and with you, gentlemen.” The local Portuguese traders became very conspicuous when De Houtman did not buy any black pepper, and wanted to wait on the next harvest. De Houtman was undiplomatic and insulting to the sultan, and was turned away for “rude behaviour”, without being able to buy spices at all. The ships then sailed east to Madura, and were attacked by pirates along the way. In Madura, they were received peacefully, but De Houtman ordered his men to brutally attack the civilian population in revenge for the unrelated earlier piracy. The ships then sailed for Bali, where they met with the island’s king in February 1597 and managed to obtain a few pots of pepper. At Bawean, an island north of East Java, one of the ships was purposely set on fire, and the crew divided over the other three ships. When the sailors had enough of the exhausting voyage, it was decided not to go to the Moluccas as planned, but return to Holland. On their route back to Holland Portuguese ships prevented them from taking on water and supplies at St. Helena. Out of the 249 crew members that left two years earlier only 87 returned, too weak to moor their ships themselves. Though the trip was a humanitarian disaster and financially probably just broke even, it was a symbolic victory. Within five years, sixty-five more Dutch ships had sailed east to trade. Soon, the Dutch would fully take over the spice trade in and around the Indian Ocean.